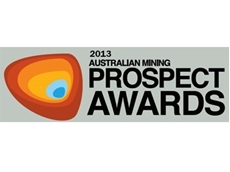 Mining continues to play an important part in the overall economy of Australia. For all of the discussion about the sector many people don’t realise that mining only employs 264,400 (source: ABS). This is just a fraction of Australia’s total labour force and even that number is often conflated given that many who work in mining are employed on infrastructure or services activities rather than directly in operations. Each month I spend some time collating stories from a wide range of industry and media sources to build some analytics around the current state of mining employment in Australia. The month of August 2014 was quieter than previous months when more than 3,000 jobs were lost in June and another 1,000+ in July yet at the end of August we still saw more jobs lost than gained. 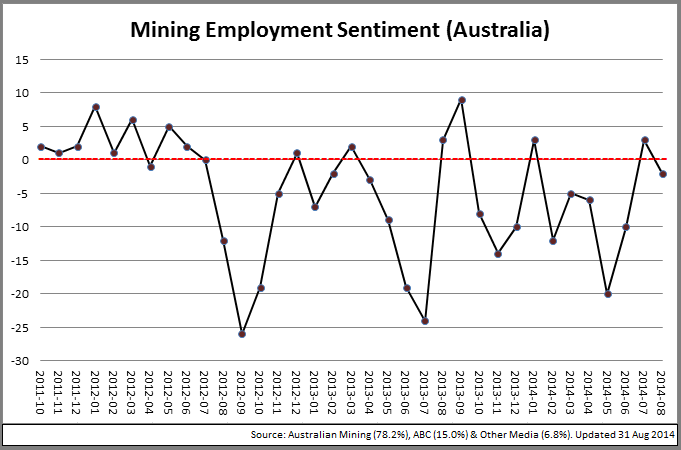 Here are the charts for Australian Mining Employment through to the end of August 2014. The opening infographic looks at total job gains and losses by State or Territory for the month of August. 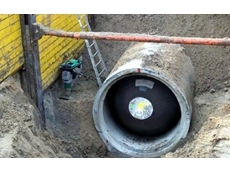 Where a job cannot be affixed to a certain site then the losses or gains are attributed to Australia (Non Specified). Data-Points: Queensland was the only state to lose more jobs than it gained, while New South Wales and Western Australia picked up a small amount each. Two Australian companies, ResCo and Bluestone Global, cut 330 staff across the country. 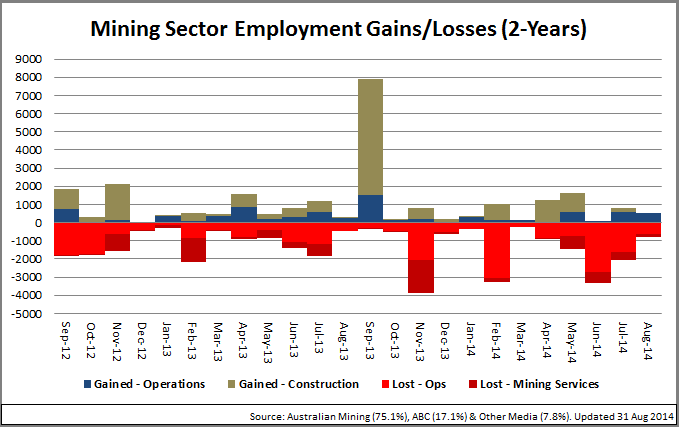 The first employment chart looks at the previous 24-months from a total mining employment gain and loss perspective. The positive employment numbers are split into those that reflect infrastructure (tan) and operational (blue) gains. 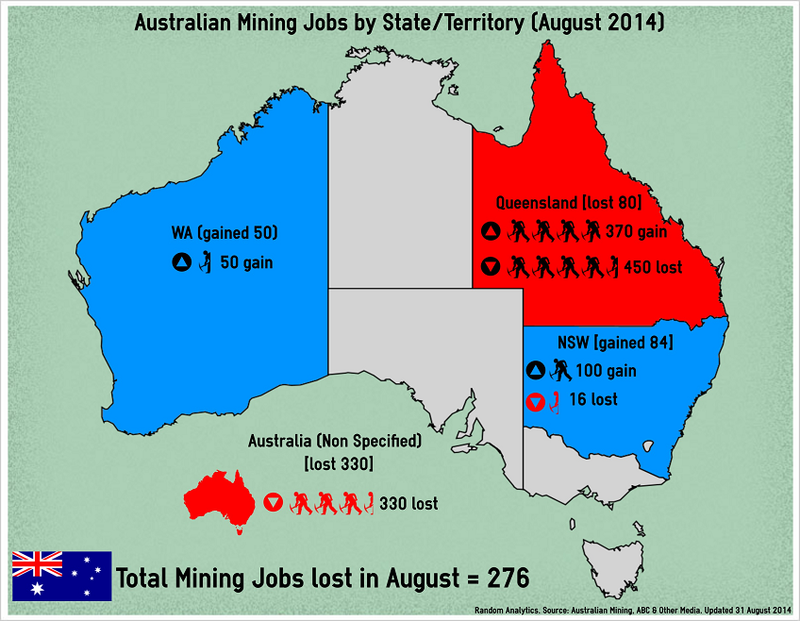 Job losses are then split into operational (red) and mining services (maroon). Mining services can include mining specific service centres, distribution, back-office functions and transport (thanks to learitee from the Australian Mining online community for the suggestion). Data-Points: All of the 520 job gains in August were operational including the Baralaba North Coal expansion (QLD, Coal, 200); Maules Creek (NSW, Coal, 100) and I’ve included the 120 staffers at the recently opened QCLNG Gas Operations Hub. On the minus side Peabody Energy cut 350 staff from Burton Coal (QLD) including 100 contractors by text message and Glencore cut another 100 from its Newlands Coal (QLD) site. 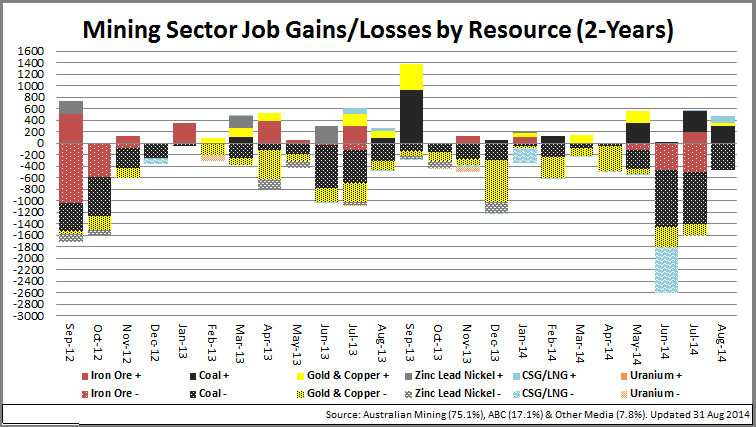 The next employment chart looks in more detail at the main resource types (Iron Ore, Coal, Gold/Copper, Zinc/Lead/Nickel, CSG/LNG and Uranium) by either a job gain or a loss. Across the six resource types there was actually a gain of 6-jobs overall. The last chart tracks employment gains and losses sentiment and is now back dated toOctober 2011. Data-Points: Sentiment took a slightly negative turn this month even with a lot of positive news including final approvals for Adani’s Carmichael Coal (QLD) and other smaller sites. 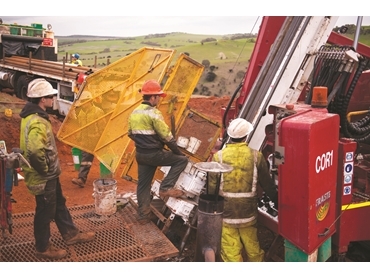 With iron ore now touching on $80pmt during the month it has been hard to generate much good news in the West and Venture Minerals Riley Iron Ore (TAS) has deferred its project claiming approvals delays on top of poor pricing. Another interesting point is that now I’ve pushed back the sentiment to Q4 2011 you can now see a lengthy period of good sentiment. That period of positive sentiment represented the sustained period of growth following the global recession stimulus package implemented by the Chinese several years before. WorleyParsons again cut a significant amount of jobs across its global network. Recent news reports are stating they cut 1,700 jobs this year yet my research tells me the number is more likely to be 1,900. Furthermore this is the latest in a tranche of cuts and I believe they are close to cutting 4,800 since late 2012. WorleyParsons always discuss global job-cuts but given that most of their losses are currently occurring in Australia I suspect the bulk of recent layoffs would be amongst Australian employees. No journalist that I can see has put that question to them. Not the best month but neither was it the worst. I continue to see trouble brewing if the iron ore price remains at $80pmt so I would be keeping a weather-eye on that over the next couple of months.